Elijah of Buxton, recipient of the Newbery Honor and winner of the Coretta Scott King Award, joins the Scholastic Gold line, which features award-winning and beloved novels. This edition includes exclusive bonus content! 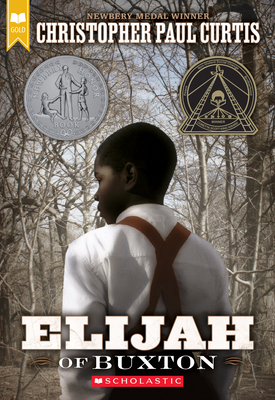 Eleven-year-old Elijah lives in Buxton, Canada, a settlement of runaway slaves near the American border. Elijah's the first child in town to be born free, and he ought to be famous just for that -- not to mention for being the best at chunking rocks and catching fish. Unfortunately, all that most people see is a "fra-gile" boy who's scared of snakes and tends to talk too much. But everything changes when a former slave steals money from Elijah's friend, who has been saving to buy his family out of captivity in the South. Now it's up to Elijah to track down the thief -- and his dangerous journey just might make a hero out of him, if only he can find the courage to get back home.